Nintendo's virtual currency can now be used on classic games, but the price tags are probably heftier than you'd prefer. Your Club Nintendo coins are normally good for items like patches, greeting cards, and posters. However, Nintendo has revealed that it's got some new redeemable prizes for all of you who own said coins: The publisher is now offering a selection of games on the North American Club Nintendo site. It sounds like Nintendo is going to be offering games from now on, though the selection will rotate on a monthly basis. Through January 10th, 2012, these are the games that you can exchange your coins for: Super Mario Kart (100 Coins), 3D Classics: Xevious (100 Coins), Fluidity (150 Coins), and Mario vs. Donkey Kong: Minis March Again (150 Coins). 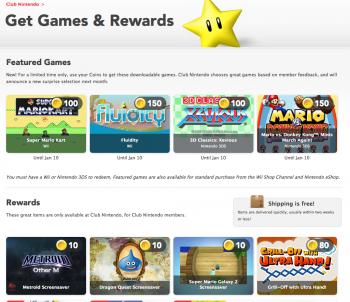 Now, Club Nintendo coins are virtual currency pieces that you receive for free when you buy official Nintendo products. A Wii game will net you somewhere around 50 coins, though other products provide different amounts. So, while the coins are a free bonus, you're still spending a significant amount of cash to earn them. That means you'd have to buy three Wii games in order to get a game that would normally cost $8 on Nintendo's eShop. So, instead of spending your hard-earned coins on some of these games, I'd suggest you save up and snag something like Legend of Zelda poster set or the Super Star messenger bag.